What’s John’s frame of reference and what does it mean today? (Genesis 3: 3 - 6) Now the serpent was more subtle than any other wild creature that the Lord God had made. He said to the woman, “Did God say, ‘You shall not eat of any tree of the garden’?” And the woman said to the serpent, “We may eat of the fruit of the trees of the garden; but God said, ‘You shall not eat of the fruit of the tree which is in the midst of the garden, neither shall you touch it, lest you die.’” But the serpent said to the woman, “You will not die. For God knows that when you eat of it your eyes will be opened, and you will be like God, knowing good and evil.” So when the woman saw that the tree was good for food, and that it was a delight to the eyes, and that the tree was to be desired to make one wise, she took of its fruit and ate; and she also gave some to her husband, and he ate. So when the woman saw that the tree was good for food, There it is, the lust of the flesh, our bodies require food for sustenance. and that it was a delight to the eyes, Here is the lust of the eyes, the fruit was attractive and looked delicious. and that the tree was to be desired to make one wise, she took of its fruit and ate; Desiring to know what God knows she disobeyed God’s command and ate, an act of pride. A willful action follows after the whims of a prideful thought, Eve was following after the very same mindset of the fallen angel Lucifer who appeared as the serpent and tempted her. And because she succumbed to the temptation along with her mate Adam who agreed, mankind instantly took on the same fallen personality traits of Lucifer and both were thus expelled from the Garden of Eden. (Isaiah 14: 12 - 14) “How you are fallen from heaven, O Day Star, son of Dawn! How you are cut down to the ground, you who laid the nations low! You said in your heart ‘I will ascend to heaven; above the stars of God I will set my throne on high; I will sit on the mount of assembly in the far north; I will ascend above the heights of the clouds, I will make myself like the Most High. Questioning God’s word and using half truths, which are nothing but lies disguised in fragments of truth, was the same method used by Satan when he tempted Christ unsuccessfully after His forty day fast in the desert recorded in the book of Matthew. 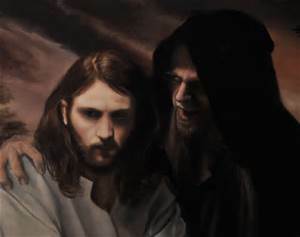 (Matthew 4: 1 - 11) Then Jesus was led up by the Spirit into the wilderness to be tempted by the devil. And when He had fasted forty days and forty nights, afterward He was hungry. Now when the tempter came to Him, he said, “If You are the Son of God, command that these stones become bread.” But He answered and said, “It is written, ‘Man shall not live by bread alone, but by every word that proceeds from the mouth of God.’” Then the devil took Him up into the holy city, set Him on the pinnacle of the temple, and said to Him, “If You are the Son of God, throw Yourself down. For it is written: ‘He shall give His angels charge over you,’and, ‘In their hands they shall bear you up, Lest you dash your foot against a stone.’” Jesus said to him, “It is written again, ‘You shall not tempt the Lord your God.’” Again, the devil took Him up on an exceedingly high mountain, and showed Him all the kingdoms of the world and their glory. 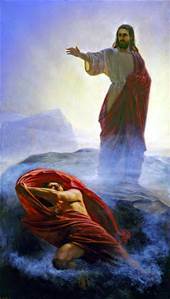 And he said to Him, “All these things I will give You if You will fall down and worship me.” Then Jesus said to him, “Away with you, Satan! For it is written, ‘You shall worship the Lord your God, and Him only you shall serve.’’ Then the devil left Him, and behold, angels came and ministered to Him. Consider what transpired there in terms of current times. It is interesting to note that every single commercial and sales person employs that same Lucifarian method of temptation to create desire. We are encouraged to purchase an item because it looks good, we then imagine how that item will enhance our lives and we often impulsively go ahead and purchase it even though we may not be able to afford it, or we realize that it might be excessive materialistic behavior. Consider how timely and never changing bible scripture really is and how apropos it is for us today. I marvel about that because people are all so prone purchasing items they can ill afford on credit with borrowed money. The following verse from Proverbs rings true today. (1Corinthians 2: 6 - 14) However, we speak wisdom among those who are mature, yet not the wisdom of this age, nor of the rulers of this age, who are coming to nothing. But we speak the wisdom of God in a mystery, the hidden wisdom which God ordained before the ages for our glory, which none of the rulers of this age knew; for had they known, they would not have crucified the Lord of glory. But as it is written: “Eye has not seen, nor ear heard, nor have entered into the heart of man the things which God has prepared for those who love Him.” But God has revealed them to us through His Spirit. For the Spirit searches all things, yes, the deep things of God. For what man knows the things of a man except the spirit of the man which is in him? Even so no one knows the things of God except the Spirit of God. Now we have received, not the spirit of the world, but the Spirit who is from God, that we might know the things that have been freely given to us by God. These things we also speak, not in words which man’s wisdom teaches but which the Holy Spirit teaches, comparing spiritual things with spiritual. But the natural man does not receive the things of the Spirit of God, for they are foolishness to him; nor can he know them, because they are spiritually discerned. I have often wondered about the incredulous amounts of oil that has been taken out of the earth over the last hundred years by numerous nations. The level of consumption has grown exponentially each year as more countries become part of the twentieth century manufacturing and producing world. In 1872, the standard oil barrel was firmly established as 42 US gallons. A recent estimate of total world oil consumption in 2014 amounted to 20,802 barrels of oil per day which amounts to 873,684 gallons used up each day of the year or 75,927,30 barrels a year. These figures are rather astounding when one considers how much of the earth’s volume is filled with solid rock, molten magma, coal, water and natural gas which leaves one wondering about the standardized story of how the dinosaurs and the primordial forests decayed down through the ages supposedly creating these vast oil reserves, thus allowing the unbelieving world to negate God from the picture entirely. British Petroleum has provided an intriguing update to its global oil reserves estimate in the company's recent yearly review of energy statistics. BP raised its reserve estimate by 1.1% to 1,687.9 billion barrels, which is enough oil to last the world 53.3 years at the current production rates. However, there's likely a lot more oil left in the tank beyond what BP sees today. This statement once again leaves the primordial explanation wanting and extremely doubtful for a believer who understands that God created all things with simply a word, speaking all things into existence which remains fully under His control. Consider the following old testament story of God’s provision through nature and the prophet Elijah which illustrates how the needs of those who trust in Him will be fulfilled. When Ahab became King of Israel the backdrop was set for one of the most astounding shows of God’s providence through His prophet Elijah as Ahab and Jezebel continued to murder the prophets while attempting to eradicate all trust in the one true God of Israel. (1Kings 16: 29 - 32) In the thirty-eighth year of Asa king of Judah, Ahab son of Omri became king of Israel, and he reigned in Samaria over Israel twenty-two years. Ahab son of Omri did more evil in the eyes of the Lord than any of those before him. He not only considered it trivial to commit the sins of Jeroboam son of Nebat, but he also married Jezebel daughter of Ethbaal king of the Sidonians, and began to serve Baal and worship him. “As surely as the Lord your God lives,” she replied, “I don’t have any bread, only a handful of flour in a jar and a little olive oil in a jug. I am gathering a few sticks to take home and make a meal for myself and my son, that we may eat it and die.” Elijah said to her, “Don’t be afraid. Go home and do as you have said. But first make a small loaf of bread for me from what you have and bring it to me, and then make something for yourself and your son. For this is what the Lord, the God of Israel, says: ‘The jar of flour will not be used up and the jug of oil will not run dry until the day the Lord sends rain on the land.’” She went away and did as Elijah had told her. So there was food every day for Elijah and for the woman and her family. For the jar of flour was not used up and the jug of oil did not run dry, in keeping with the word of the Lord spoken by Elijah. As long as God’s elect remains on the earth He will continue to provide for the needs of mankind as He sees fit in spite of the dark thinking of those who believe the world’s destiny is somehow limited and controlled by man. Prayer is the outflow of faith and the only overt and sometimes covert evidence of the believer’s acknowledgement and dependence on God. It is the only means by which we communicate with our Creator, either through words spoken or by thoughts and sighs which only the Spirit can understand. There is no specific time or place when we should pray, I often turn to the Lord out on my patio while having morning coffee. At my age, and after reflecting on some of the things I have endured and how God has been there all the time ordering my footsteps, I have no choice but to be thankful and to express my thankfulness to Him. Oftentimes I have taken advantage of the noise of my morning shower and the exhaust fan where no one can hear me but God while praying about those stressful things that can bring grown men to tears and make them want to cry out to God for His forgiveness and providence. “Now faith is the assurance of things hoped for, the conviction of things not seen. For by it the men of old received divine approval.” (Hebrews 11: 1 - 2) We as believers want to receive divine approval as well. “ And without faith it is impossible to please him. For whoever would draw near to God must believe that he exists and that he rewards those who seek him. (Hebrews 11:6) The converse of that is also true, meaning that He does not reward those who don’t seek him! How often I have yearned to hear from my adult sons as I wondered how they are doing and if all is well with them. The only time they ever call me is if they want something or need my help. We shouldn’t treat our Creator as shamefully when He loves us so much. (Proverbs 15:29) The Lord is far from the wicked, But He hears the prayer of the righteous. (Matthew &: 7 - 8) “Ask, and it will be given to you; seek, and you will find; knock, and it will be opened to you. For everyone who asks receives, and he who seeks finds, and to him who knocks it will be opened.” The converse of that is also true, those who don’t ask will not have any answers. Those who don’t seek will find nothing. Those who fail to knock on wisdom’s door cannot expect to receive any. Prayer is a twofold act of faith which entails both doing and believing. I have often wondered about those who pray out loud in the congregation with such eloquence. My prayers are often such simple and sometimes garbled messages to God that I wonder if He even understands what I’m trying to say. But here’s what Jesus says God wants from us, after all He already knows all those flattering praises that men down through the ages have said, He’s more interested in the matters of the heart, our attitude means everything. (Matthew 6: 5 - 8) “And when you pray, you shall not be like the hypocrites. For they love to pray standing in the synagogues and on the corners of the streets, that they may be seen by men. Assuredly, I say to you, they have their reward. But you, when you pray, go into your room, and when you have shut your door, pray to your Father who is in the secret place; and your Father who sees in secret will reward you openly. And when you pray, do not use vain repetitions as the heathen do. For they think that they will be heard for their many words. “Therefore do not be like them. For your Father knows the things you have need of before you ask Him. Labels: believing, Matthew 21:22) “And whatever things you ask in prayer, Prayer of a righteous man avails much, you will receive"